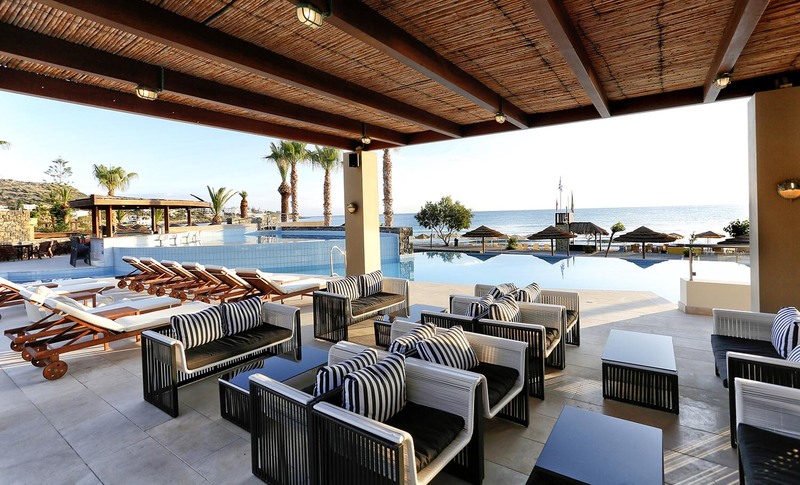 SENTIDO Blue Sea Beach operates on Half Board and All Inclusive basis to the highest quality standards. HACCP (Food Safety Management System) and ISO 22000 principles are followed and local ingredients are carefully sourced to deliver fresh and innovative food. Enjoy your breakfast, lunch and dinner indoors or outdoors with magnificent views to the dazzling blue sea at the hotel's main restaurant. For the best start of the day choose breakfast from the American style buffet with live cooking, available between 07:15 to 10:30. Colorful salads, sumptuous main courses, mouthwatering fruits and desserts are offered for lunch from 12:30 to 14:30. 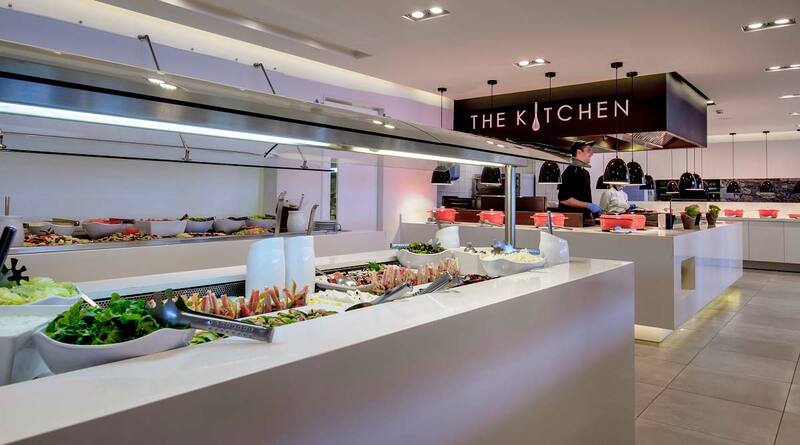 At dinner between 18:30 to 21:30, the Chef prepares recipes from International, Mediterranean and Greek cuisine infused with fresh ingredients, herbs and spices to please all taste palates. 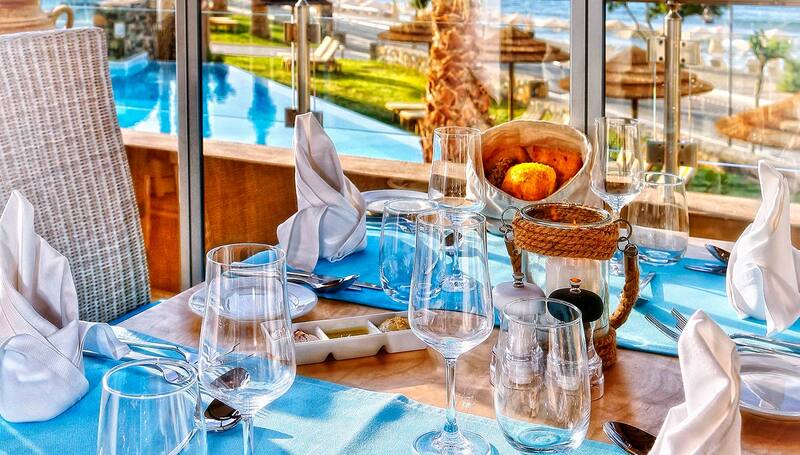 Taste the freshest ingredients that Greece has to offer, prepared to perfection in our A la carte Restaurant, senses will be immersed in the delicious flavours of Greek and International dishes, in a lovely seaside setting sure to enrich every meal. European continental breakfast is served from 10:30 to 11:30 a.m. for guests who prefer a late start of the day. Lunch is served from 12:30 to 16:30, while dinner starts at 19:00 to 23:00. Relax watching the sunset or lose yourself under the stars sipping a signature cocktail at the Blue Bar. On the beach promenade, with a rich selection of coffees and teas , chill out music and an array of drinks and cocktails, Blue Bar is the place to start your summer evening and create your holiday moments. Perfectly situated at the edge of the pool adjacent the beach, the pool bar is an oasis to our sun- kissed guests. Centrally located, the hotel's Main bar features all-time favorite drinks, spirits (and snacks) in a relaxed setting from 10:00 to 01:30.